If you have been using the recent versions of Ubuntu and variants you may have noticed that although there is no wallpaper slideshow function in the Appearance settings, Ubuntu in fact actually does support wallpaper slideshows. Using a wallpaper slideshow requires editing of XML file/s which most users would not bother to deal with. 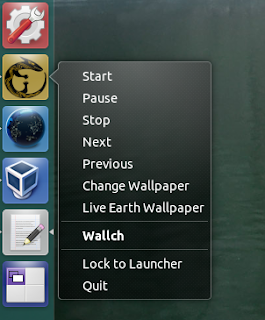 Hence, Wallch is a simple wallpaper slideshow program that allows you to do just that. Easily and efficiently create your own wallpaper slideshow without the need of editing any XML file. Of course, it has limited functionality so for advanced users who love to tweak, XML is still the best way to go. 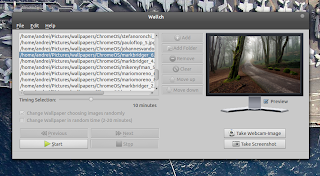 The most recent version of Wallch natively supports Ubuntu's Unity interface. From the quick links, you can easily "Start", "Stop", and "Pause" the current slideshow. There are a few other handy options such as manually changing to the next wallpaper or just opening the program window itself. 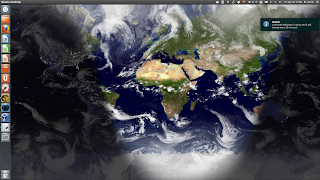 If you are really bored and out of wallpapers to use, you can always resort back to the Live Earth Wallpaper. Its simple and down to earth. For Ubuntu 12.04: You can simple install Wallch from the Ubuntu Software Centre or click this link if you are too lazy to. For those who love the Terminal you can always do a sudo apt-get install wallch. For Ubuntu 11.10: You will have to use the older version of Wallch. These steps are quite important if you want Wallch to run automatically when you log in. Step 3: For command, type sh -c "sleep 10 && wallch --constant &"
Step 4: You are done! Enjoy your wallpaper slideshow! ChäoS;HEAd tries to be different than everyone else but this experimental anime fell apart too quickly after the first couple of episodes. It was a good idea but was poorly executed. It will cause chaos in your head. I wonder how ChäoS;HEAd would have rated if only the story was executed properly. Perhaps we would have understood the situation a bit more and connected with the characters more closely. However, what has been done has been done; and we are left with a messy plate to deal with. The start was captivating and interesting; unfortunately that quickly fell apart. We see Takumi Nishijou is basically a otaku living by himself and doesn't care about anything or anyone around him. Just living in the delusions. One day, that carefree life ends as mysterious 'New Gen' murders start happening all around him. After that he gets a random horrific picture sent to him and he goes to investigate and meets a mysterious Pink-Haired girl at the murder scene. After the initial shock followed by more incidents and incomprehensible delusions, somehow the main characters obtain "D-Swords" that are invisible to people. Random right? It gets even messier here as somehow Takumi Nishijou is actually a delusion himself of another him. In the end, the world is controlled by delusions and is up to the main characters to stop some evil organisation and save the world. That's pretty much the story. Pretty confusing and incomprehensible. The lack of cohesion between scenes and relationships between characters ruined the story. Too many plot holes and unexplained details made this anime too messy to watch. The action was good though if you discard the story. The art was rather excellent in my opinion apart from the characters. The characters were rather generic and lacked fine detail. However, the background art and environments were well illustrated. The "D-Swords" looked pretty good as well. In the end, to keep you going to the end try focusing more on the art and action and not on the story itself. Since this anime was set in Shibuya I had some nostalgic moments related to the Nintendo DS game "The World Ends With You". Some elements were similar such as the central crossing, the shops and the various places that the anime features. ChäoS;HEAd's soundtrack and background music was not bad. The theme songs were quite catchy with some nice beats to it. Character voice acting was well done and I could figure out some popular voice actors from other animes. Sound effects and vocal performances also highlight various sequences. Basically it was decent enough to be enjoyed but not considered to be excellently composed. If you lose focus in the story you can just focusing on the characters on hand. If you are a otaku you will come to understand and like Takumi. If you are not then you will probably think him as a loser or a wimp. Apart from Takumi there's a wide range of girls to choose from. Each have their own personalties and attitudes from cute to scary. Honourable mention to Rimi Sakihata; the girl who looks similar to Mirai Nikki's Yuno Gasai; or is it the other way around? Anyhow, both have pick hair, have psychological issues and have a dark secret. Perfect right? 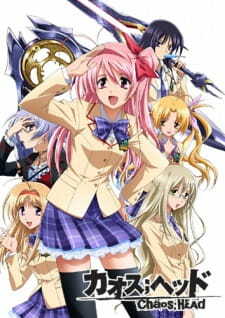 Moving on, the other characters were wuite entertaining indeed with their secret "D-Swords" and cool attitudes. Overall, it was both a enjoyable and disappointing experience at the same time. I was disappointed at the story and character development. I liked the art, theme songs and the character themselves. In the end, I think it was a disaster from the start; whether it was a good or bad is really how you came to understand the anime. In my opinion, it was neither good nor bad. Decently illustrated. The scenery was great but the characters lacked detail. Theme songs were decent and voice acting was good. Rather generic. The characters looked nice but rather I really don't understand why they were chosen to be the way they are. Confusing. The action was decent to watch but the endless delusions really broke the story. Perhaps watching this just for the fun of it might be worth your time. The Linux Mint team is proud to announce the release of Linux Mint 13 “Maya” RC. Head over here to check out what's new in Linux Mint 13.